Pickled herring (Estonian: marineeritud heeringas, Latvian: marinēta siļķe, Lithuanian: marinuota silkė, Swedish: inlagd sill, Danish: spegesild, Norwegian: sursild, Finnish: silli, Dutch: zure haring, German: Bismarckhering, Czech: zavináč, Russian: маринованная селёдка, Polish: śledzie w occie, Ukrainian: оселедець) is a traditional way of preserving herring. Most cured herring uses a two-step curing process. Initially herring is cured with salt to extract water. The second stage involves removing the salt and adding the herring to a brine – typically a vinegar, salt, sugar solution – to which ingredients such as peppercorn, bay leaves and raw onions are added. Additional flavourings may also be used, including sherry, mustard and dill, while other non-traditional ingredients have also begun being included in recent years. Pickled herring remains a popular food and/or ingredient to dishes in many parts of Europe including Scandinavia, the Baltic, Eastern and Central Europe, as well as the Netherlands. It is also associated with Ashkenazi Jewish cuisine, becoming a staple at Kiddushes and social gatherings. Pickled herring is one of the twelve dishes traditionally served at Christmas Eve in Poland, Lithuania, and Ukraine. Pickled herrings have been a staple in Northern Europe since Medieval times, being a way to store and transport fish, especially necessary in meatless periods like Lent. The herrings would be prepared, then packed in barrels for storage or transportation. In the Nordic countries, once the pickling process is finished and depending on which of the dozens of classic herring flavourings (mustard, onion, garlic, lingonberries etc.) are selected, it is eaten with dark rye bread, crisp bread, sour cream, or potatoes. This dish is common at Christmas, Easter and Midsummer, where it is frequently eaten along with spirits like akvavit. Soused herring (maatjesharing or just maatjes in Dutch) is an especially mild salt herring, which is made from young immature herrings. The herrings are ripened for a couple of days in oak barrels in a salty solution, or brine. 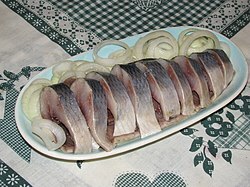 The term “soused herring” in English can also describe a marinated herring that has been cooked. Rollmops are pickled herring fillets rolled (hence the name) into a cylindrical shape around a piece of pickled gherkin or an onion. They are thought to have developed as a special treat in 19th century Berlin, and the word borrowed from the German. Pickled herring, especially brined herring, is common in Russia and Ukraine, where it is served cut into pieces and seasoned with sunflower oil and onions, or can be part of herring salads, such as dressed herring (Russian: Сельдь под шубой, Ukrainian: Оселедець під шубою, lit. 'herring under a fur coat'), which are usually prepared with vegetables and seasoned with mayonnaise dressing. Brined herring is common in Ashkenazi Jewish cuisine, perhaps best known for vorschmack salad known in English simply as "chopped herring" and as schmaltz herring in Yiddish. In Israel it is commonly known as dag maluach which means "salted fish". Pickled herring can also be found in the cuisine of Hokkaidō in Japan, where families traditionally preserved large quantities for winter. In Nova Scotia, Canada, pickled herring with onions is called "solomon gundy" and is quite popular. (Not to be confused with the Jamaican pickled fish pâté of the same name). "Bismarck herring" (German Bismarckhering) is the common name for pickled herring in Germany, and is sometimes sold elsewhere under that name. There are various theories as to why the product is associated with Bismarck. It is rich in tyramine and thus should be avoided in the diet of people being treated with an antidepressant monoamine oxidase inhibitor. ^ Slater, Nigel (2011-04-09). "Classic Soused mackerel". The Guardian. Retrieved 10 April 2011. ^ Brown CS and Bryant SG (1988) "Monoamine oxidase inhibitors: safety and efficacy issues"[permanent dead link] Drug Intell Clin Pharm, 22(3):232–235. ^ "Fish, herring, Atlantic, pickled Nutrition Facts & Calories". Retrieved 23 March 2017. ^ "Foods highest in Vitamin D". Retrieved 23 March 2017.